It's all change here in England this week! After a rather watery summer, when the promised days of sunshine faded into a memory, and temperatures made history because they were so low, we've finally been rewarded with our long-promised heatwave, and are breaking all the records for September! Yesterday, temperatures crept up to thirty degrees centigrade in southern England, and it felt like summer for the first time in weeks. So perhaps this year nature is giving us a reprieve before the snow comes, because forecasters say we'll be blanketed in the white stuff by the end of October! I've been amazed by how fast the trees are changing colour here in the south, and have spent the last week looking at gardens that normally peak in October. 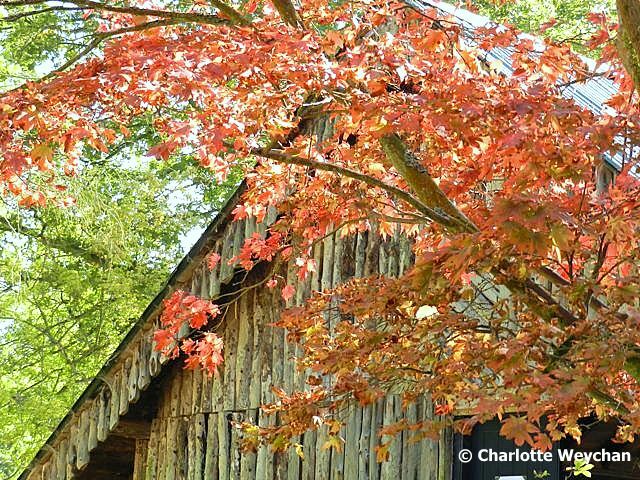 My quest for autumn colour finally took me to Winkworth Arboretum in Surrey - the 100-acre paradise created by Dr Wilfred Fox some 80 years ago. 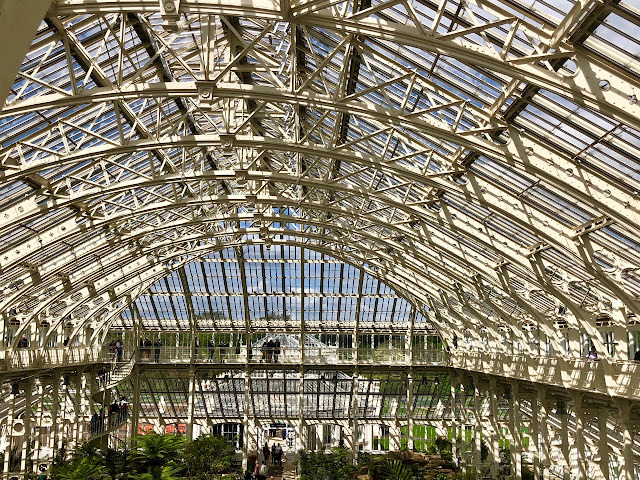 Fox was a medical doctor specialising in dermatology, but when he wasn't in his London consulting rooms, his great passion was trees, and in 1937 he started creating the arboretum that survives today. 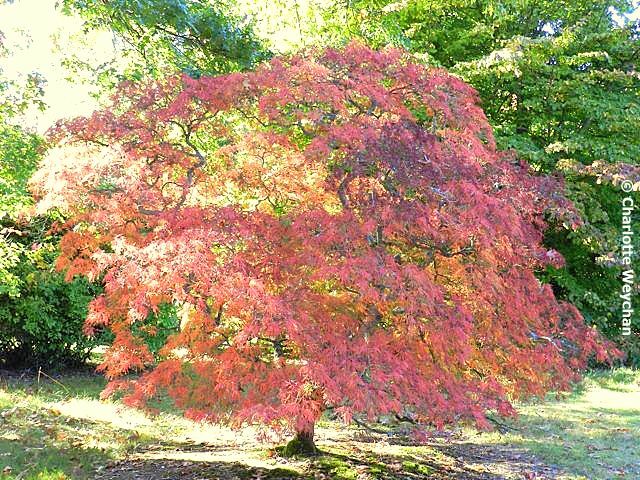 Dr Fox drew much of his inspiration from other English arboreta including Sheffield Park and Westonbirt. He had been involved in founding the Roads Beautifying Association prior to purchasing Winkworth and in 1948, was awarded the Victoria Medal of Honour by the Royal Horticultural Society for his work in promoting ornamental street tree planting. 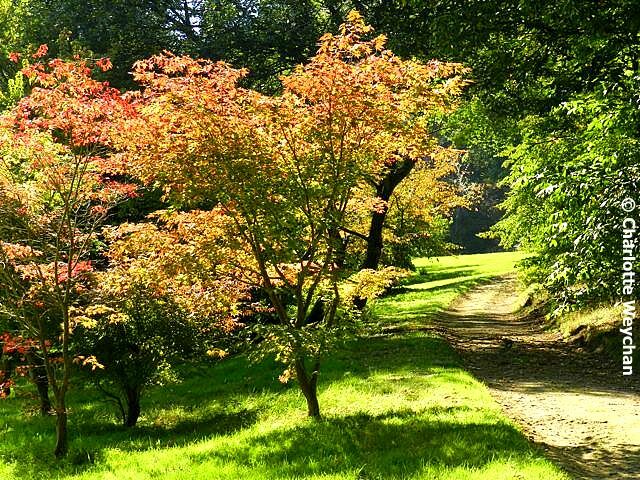 When he first purchased Winkworth, he concentrated on maples, which give such fine autumn colour, but in later years he planted azaleas, magnolias and Japanese cherries. The combination makes for spectacular colour displays in both spring and autumn. 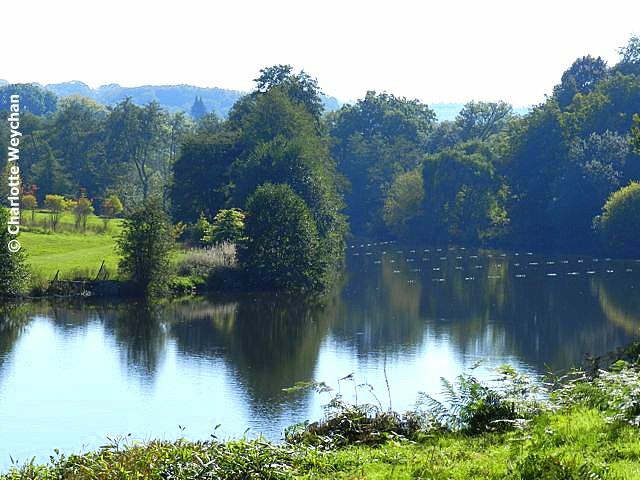 In 1952 Dr Fox gave 60 acres of his woodland paradise to the National Trust; five years later they acquired a further 35 acres; and today Winkworth is classed as one of Britain's great arboreta. 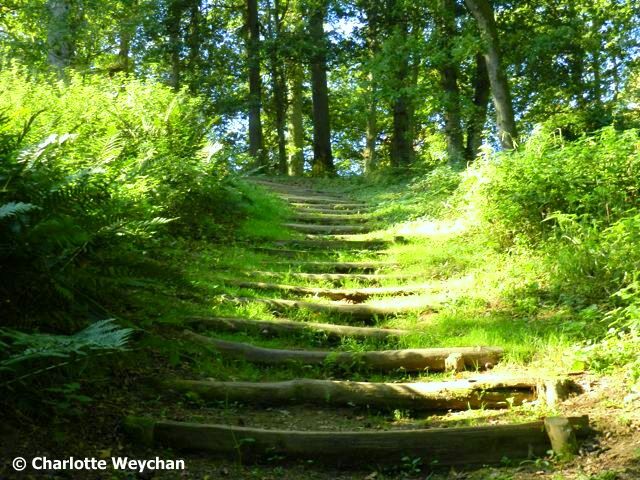 Winkworth is also famous for its carpets of bluebells in springtime, although the trees make it a haven for walkers and woodland lovers throughout the year. Just a word of warning though - it's hillside position means that it's not ideal for disabled visitors - to enjoy all aspects of the arboretum, you need to descend into the valley, and even though there are ample woodland paths, the terrain is steep and many of the trails include steps (above), that make wheelchair access difficult. What a lovely, peaceful place filled with wonderful, graceful trees. I wish we had more of a change in seasons than we have down here. Sine we don't, I'll enjoy the changes through posts like yours. Again, thank you so much for the tour and the lovely inspiring photos. And your header now is very beautiful too. It's always a delight to view your blog, Charlotte, the only one I know that covers so many different gardens so frequently, and with such good research. 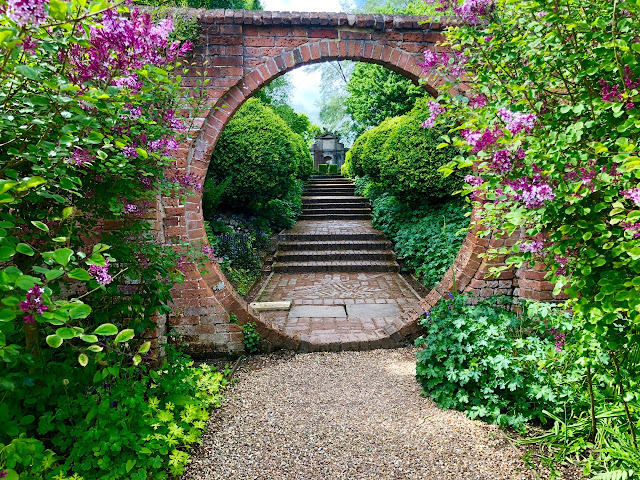 You show us the very special charm of each garden you visit, Winkworth is no exception. Even up here in Aberdeen the temperature rose to a glorious 23c, Oh please no, not snow in October.